Hey guys! Welcome to my monthly Ipsy unboxing! This month's Ipsy theme was Rockstarlet, which I actually think is a pretty good theme and pretty fitting for November, which I think is the kind of month that's perfect for more rocker type makeup looks. I don't know what it is, but I love edgy makeup as the weather gets colder. Am I alone in this? Anyway, I'm not going to get rambly with this one, so keep reading for a look at what I got this month! Can we just talk about this bag for a second? 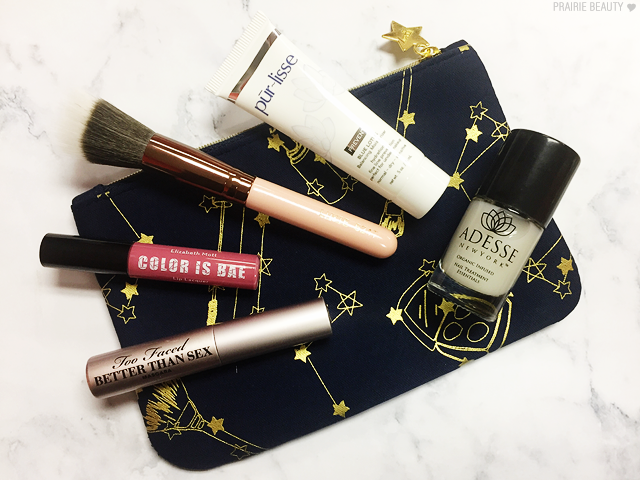 Because seriously, I think this is my favorite bag that Ipsy has ever done. 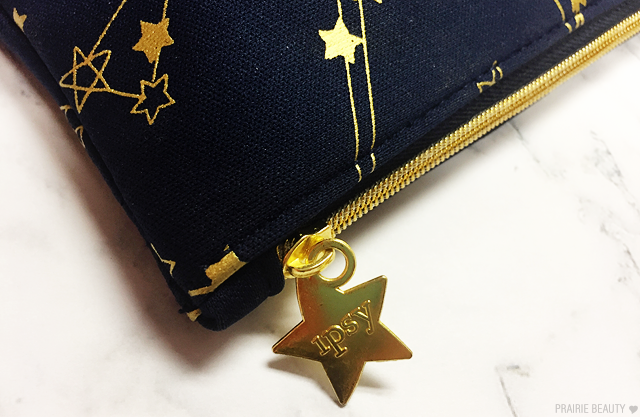 I mean, I really like the navy blue with the gold accents and the kind of makeup constellation vibe, but what I really love is the actual construction of the bag itself. Ipsy has used a lot of different textiles for the bag in the years I've been a subscriber, everything from raw cotton to textured vinyl, but this month's neoprene bag is by far my favorite. I feel like it's perfect for tossing in my bag because it'll offer some cushion to my products without being bulky and it'll be really sturdy so it can take some wear. Perfect bag! Admittedly I wasn't super excited to get this because I have about 3 or 4 similar brushes that I hardly ever use so I figured it might not get any use. 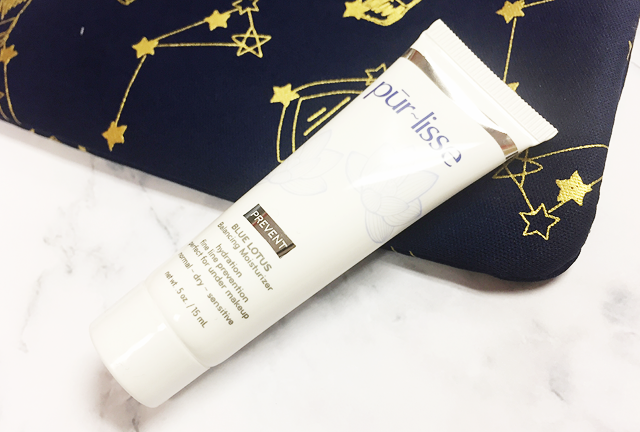 I decided to give it a try this morning though, using it to blend out my VICHY Teint Ideal Pure Light Face Roll On and I kind of fell a little bit in love with how it blended. 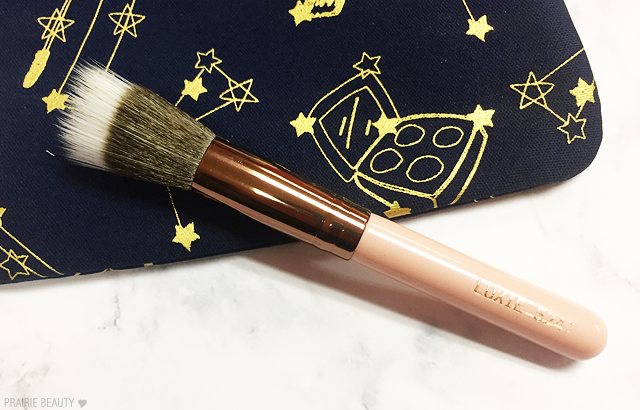 Because it's so soft, it didn't disturb my foundation but it did really easily blend the highlighter into the face seamlessly. So in the end... I'm not mad at this at all. Also, it's just pretty, isn't it? When I saw this described as a lip lacquer, I was fairly certain that I wasn't going to like it because I tend to find lip lacquers to be too shiny and sticky on my lips for my taste. Surprise for me, though, because this is a matte finish with a really light texture that builds kind of beautifully on the lips. It actually reminds me of a slightly more tacky Kat Von D Everlasting Liquid Lipstick in texture and wear. 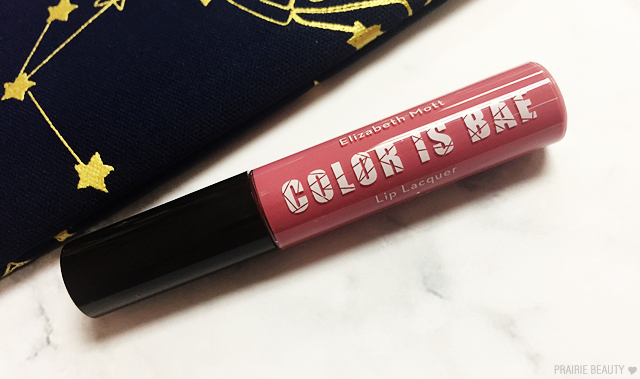 Extra bonus, this pinky mauve shade is pretty much my signature, so it fits just perfectly into my collection. I do wish, though, that the makeup industry would standardize terms, because I think that lacquer inevitably implies shiny... But that's just a nitpick that I personally have. Blehhhhhh. Okay, here's the thing. 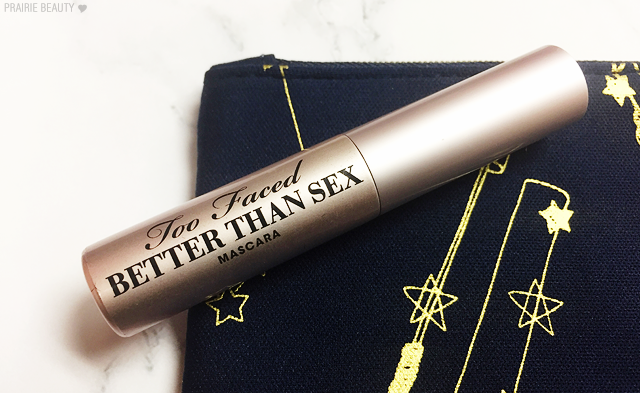 I do think this is a good mascara and I've enjoyed using it in the past... But at this point I feel like anyone who has been wanting to try this product has gotten a sample at some point already. I mean, I literally used one I already had in my collection for this picture so that I didn't have to open the box that I intend to throw in a stocking this Christmas. I think I have about three in reserve at this point. So. Yeah. I'm sure some people will be excited about this, but I'm just completely meh about it being included in Ipsy bags when it's literally included in everything else at this point as well. While I probably would have been more excited about getting a color polish, I'm not mad at this and I'm looking forward to doing my nails so that I can try it out. 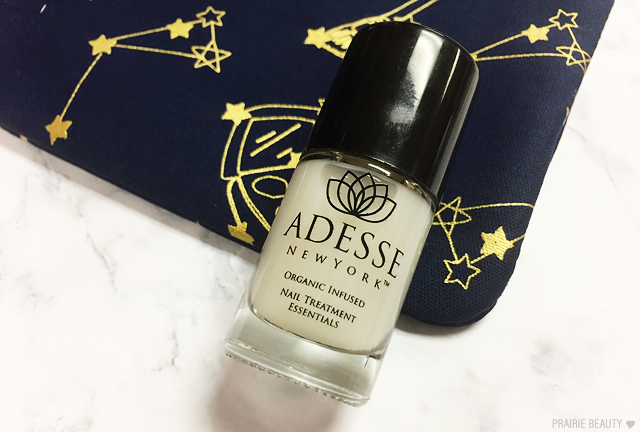 I should be using base coat more often and I should also be using nail treatments, so I'm hoping this is a twofer and it works amazingly. I mean... Gotta be an optimist about products you've never tried, right? I like pur~lisse, I really do... But of all of the skincare samples on the menu in this month's bags this is definitely the one I was the least interested in. I'll toss it in my deluxe samples box and break it out for traveling, but this really isn't one that I'm going over the moon about. It's fine. This bag is fine. I'm beginning to think that how I feel about my Ipsy bag is directly related to whether or not I have PMS... is that weird? Because currently I have PMS and I'm a little meh about this month's bag overall. I think the brush is nice, the lip "lacquer" is great, and I'm definitely interested in trying out the base coat. Also, the bag itself is RAD. So there's that. ... I probably should have waited to write this, shouldn't I? 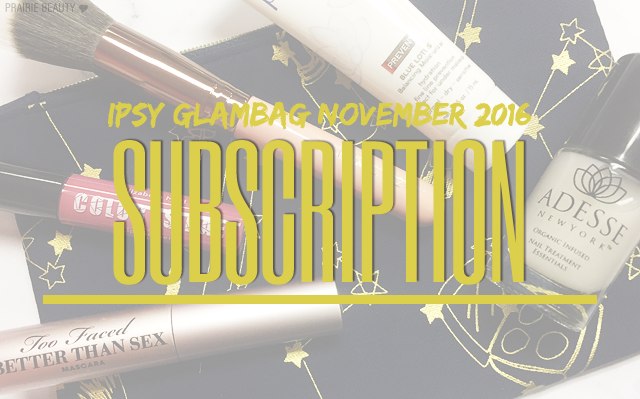 Anyway, if you want to sign up for the Ipsy service ($10US per month, plus $5US for us Canadians for 5 beauty products in a unique bag every month) I'd love if you'd use my referral link - I don't get paid, I just get points! Thanks for reading - sorry for the crankiness!